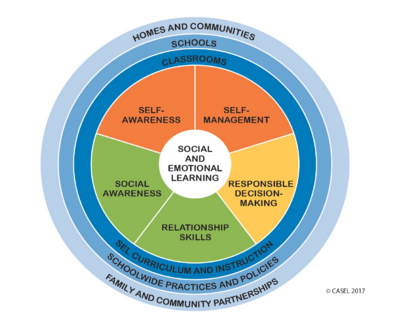 According to CASEL, Collaborative for Academic, “Social and emotional learning (SEL) is the process through which children and adults acquire and effectively apply the knowledge, attitudes, and skills necessary to understand and manage emotions, set and achieve positive goals, feel and show empathy for others, establish and maintain positive relationships, and make responsible decisions.” There are five components of Social and Emotional Learning: Self Awareness, Self-Management, Social Awareness, Relationship Skills, and Responsible Decision-Making and multiple stakeholders. On this page, you will find articles, websites, and ways in which TPCP faculty members have integrated SEL into our classes. 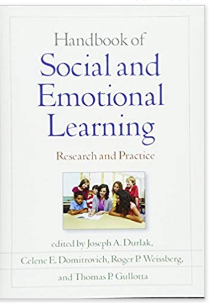 The Prosocial Classroom: Teacher Social Emotional Competence in Relation to Student and Teacher Outcomes (Jennings & Greenberg, 2009). Secondary Methods I is a course designed for students that are currently teaching or wish to teach at the secondary level. The course focuses on prominent methodological issues and the development of core teaching skills. On the very first day of class, I asked my students, “If you could teach every child in the world one lesson, what would it be?” Students responded on the site Padlet, a digital bulletin board that lets students post anonymously, but for all to see instantly. In the above picture, you may be able to see some of their responses to this question, including, “How to be intentional about their thoughts and justify them”; “Actions have effect on the around you.”; “Everyone has the power to influence someone else or themselves.”; “The power of positivity”, and “Everyone has value, everyone contributes to the world in some way.” This prompt was meant to be an introduction to social and emotional learning, but also a reminder of what is really essential. Secondary teachers often get caught up in their content material, which is important. 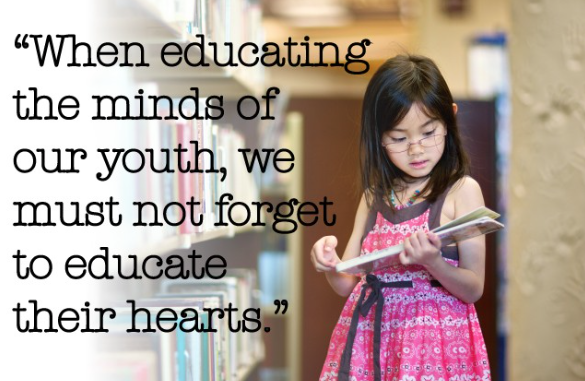 But I reminded them not to lose sight of what they really think all children deserve to know. At our first class meeting last semester, I proposed to the students who would be together for two semesters of student teaching/internships that we create a class communication charter, an idea shared with our faculty by Dr. Amy McConnell Franklin (see photo below). I asked them to individually write out how they wanted to FEEL when they were in the class. Then I asked them to write out what ACTIONS we would need to take in order to FEEL the way we wanted to feel in class. Then I asked them to write out what we would do if we had a DISAGREEMENT in class. Next, I asked them to write out how we would promote POSITIVE EMOTIONS in the class. We verbally shared our ideas, wrote them, and extracted themes from them. 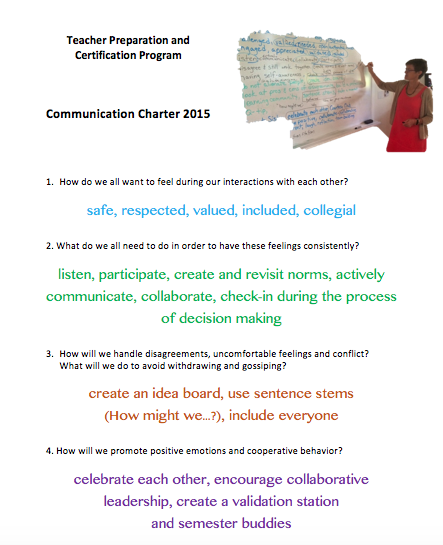 Finally, I took the themes and typed up the communication charter and shared it with the students at our next meeting. My students loved getting to decide how we would treat each other. They appreciated having input into how we would all get along as colleagues in the class. They actively wrote out answers to each question, passionately shared and discussed details and nuances of their ideas, and enthusiastically embraced the charter when I shared it with them. Chapter 5 The Neuroscience of SEL: “Dozier’s Attachment and Biobehavioral Catch Up” intervention helps adult caregivers of young children learn to reinterpret “bad” behaviors as signals that the child is actually asking for help, thus prompting the care giver to respond to “bad” behaviors by offering care rather than punishment (page 75.) This idea supports the Conscious Discipline philosophy I have been studying as I seek new ways to positively “guide” young children’s behaviors rather than to “manage” their behaviors. Chapter 9 SEL Programs for Preschool Children: Young children’s cognitive development makes them dependent upon caring adults to offer external SEL support to help young children use self control and behavior regulation. Adults have to allow young children, to “borrow” their own appropriate SEL skills until young children have developed their own (page 137). The adults in our SEL community are responsible for modeling emotional skills and positive social behaviors, as well as implementing and supporting programming. This reminds me that we need to first provide the necessary support for the teachers (mindfulness, wellness, open-communication, etc). Six principles for adult learning (p.24); Malcolm Knowles mentioned. Use this for our own workshops, classes. 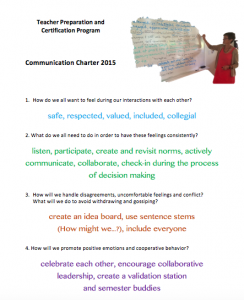 Have to monitor impact of an SEL program. We want all students to ‘catch character’ from those around them, but they need explicit, repeated instruction on how to recognize, understand, label, express, and regulate (RULER) their feelings. Something for us to consider: Does the growing proliferation of mobile technology offer new possibilities for teaching and learning SEL? 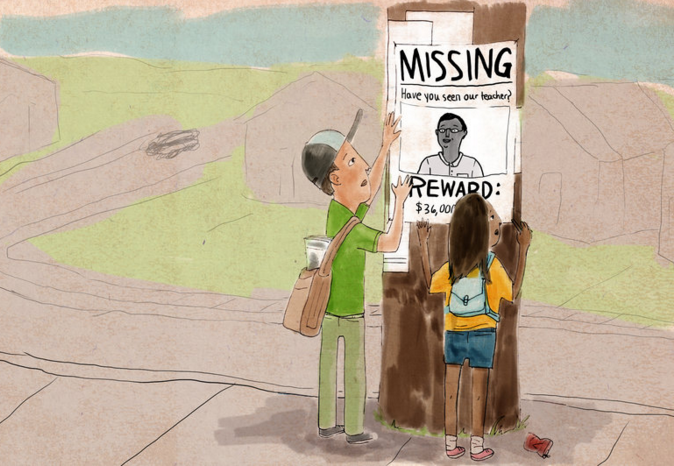 According to the National Commission on Teaching and America’s Future (2007), teacher turnover costs the U.S. up to $7 billion annually and occurs mostly at low-performing, high-poverty, high-minority schools. -SEL is definitely embedded in Classroom Management. Let’s review our syllabi from this lens. More SEL-based points in required service learning reflections. MUST see: http://www.sel4ma.org/ so many resources and ideas for us to use for Louisiana. Copyright © 2019 Social Innovation in Education. Powered by WordPress. Theme: Accelerate by ThemeGrill.